If you look at Venus this month and something doesn't seem quite right, you may have spotted a rare Venus pillar ... or better yet, a Venusdog! May 6, 2002: "Venus looked very strange," says Carol Lakomiak of Tomahawk, Wisconsin. She was watching a twilight gathering of planets in the evening sky last month -- and Venus had caught her attention. "When viewed through my 11x70 binoculars, I saw beams of light jutting from the top and bottom of the planet, and there were moments when they were visible without optical aid." She dashed inside, got her camera, and returned for a snapshot. The strange beams were still there, and she captured them on film -- perhaps the first-ever pictures of extraordinary "Venus pillars." 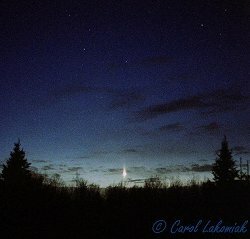 Right: Venus was just three degrees above the horizon (and setting) on April 9, 2002, when Carol Lakomiak captured this image of the apparently elongated planet. Photo details: Olympus OM-1n, 50mm lens at 1.8, 800 Kodak Max film, 10 second exposure. The pillars aren't really a part of Venus. They are an optical illusion formed in Earth's atmosphere when Venus is close to the horizon, either rising or setting. Better-known Sun pillars happen for the same reason: Kilometers above Earth's surface (where it is always cold) six-sided ice crystals form in wispy cirrus clouds. Some of the crystals are flat, resembling hexagonal pancakes. They flutter downward like falling leaves with their broad sides mostly parallel to the ground below. When the Sun is rising or setting, and sunlight glints off the nearly-horizontal faces of such crystals, a glowing vertical beam -- a "Sun pillar" -- can suddenly appear above or below the Sun itself. Below: A Sun pillar over Cleveland, Missouri, on Jan. 5, 2002. "My wife rushed into the house and told me that a beam of light was shooting straight up from the setting Sun," recalls photographer Tom Martinez. "I grabbed my Nikon Coolpix, ran outside, and snapped this picture!" Les Cowley, a retired physicist and an expert in atmospheric optics, has seen plenty of Sun and Moon pillars -- but Venus? "This is a rare sight, indeed," he says. "I was initially surprised [by Carol's photos]." Soon after he saw them, he used an optical ray tracing program called HALO to simulate the appearance of Venus setting behind distant cirrus clouds. The software, written by Cowley and colleague Michael Schroeder, is widely used to model Sun and Moon pillars and other halos. When he applied it to Venus, lo and behold, faint pillars emerged. Perhaps Venus pillars shouldn't seem surprising. After all, the planet is dazzlingly bright; only the Sun and the Moon outshine it. Sun pillars, Moon pillars, Venus pillars ... they all exist. And if Venus has pillars, then maybe it has dogs, too. Venusdogs. Venusdogs are the Venusian equivalent of sundogs -- another artifact of ice crystals in Earth's atmosphere. The same flat crystals that cause pillars also give rise to bright spots 22 degrees to the left and to the right of the Sun (and possibly Venus). While pillars are caused by reflections from ice crystals' wide tops, sundogs are formed by light bent or refracted from their short sides. "Sundogs can be blindingly bright -- much brighter than Sun pillars," notes Cowley. Likewise, Venusdogs are probably brighter than Venus pillars. No one has ever reported seeing a Venusdog, but perhaps no one ever thought to look. Cowley says sky watchers should be alert for them on evenings "when sundogs or Sun pillars have been seen around the setting Sun, or when you know that cirrus clouds are near the horizon." This month, millions of people are watching Venus every evening -- a result of the ongoing alignment of planets. 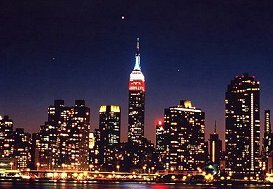 Around 8:00 p.m. local time at mid-northern latitudes, brilliant Venus pops out of the twilight low in the western sky. (A little while later Jupiter, Mercury, Saturn and Mars appear, too.) The best time to watch for Venusdogs and pillars is between 9:30 and 10:00 p.m. when the sky is dark and the planet is nearing the horizon. method: Hold your hand at arms length and spread your fingers. The distance between the end of your thumb and the tip of your pinky is about 20 degrees. Place your thumb over Venus and your pinky will point, more or less, to the spot where a Venusdog might be. Photographers using timed exposures are more likely than naked-eye observers to discover a Venusdog. However, warns Cowley, beware of internal reflections within your camera. These can masquerade as dogs or pillars. "If you're searching for Venusdogs," he continued, "point the camera so that Venus is also in the field of view. Shift and rotate the camera between exposures to rule out artifacts." 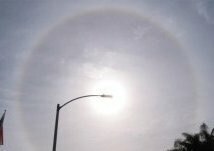 Below: On Feb. 13, 2002, a beautiful 22-degree halo formed around the Sun over El Cajon, CA. Mike O'Leary captured this image of it using his Canon G-2 digital camera. Carefully-done exposures might also reveal a faint 22-degree circular halo around the planet. Such halos are caused by hexagonal ice crystals tilted more or less randomly in all directions. "I would be delighted to see a picture of an authentic 22-degree halo around Venus," says Cowley. Most sky watchers have seen halos around the Sun or Moon -- but a Venus halo would be extraordinary. "The secret to observing [unusual things like halos and pillars]," he says, "is to keep looking up and be ready with a camera for the improbable. It pays off." more Atmospheric Optics -- (Hyperphysics) this excellent site describes the physics of many atmospheric optic effects including pillars and sundogs. Sun halos, pillars and sundogs can happen during any season. "The icy crystals that cause them form in high altitude clouds 5 km or so above Earth's surface where it is always freezing," says Bruce Wielicki, an atmospheric scientist at NASA's Langley Research Center. Relax, it's only April -- (Science@NASA) learn more about the ongoing planetary alignment, which includes Venus. May 2002 Planet Gallery -- (SpaceWeather.com) more pictures of Venus and the other planets. Clouds in the Greenhouse -- (Science@NASA) The same icy clouds that cause sundogs warm our planet by trapping heat radiated from the ground below.